Baby steps to eating healthier. I firmly believe in the power of baby steps when it comes to switching to a healthier life style. I talked about easing into an exercising routine earlier. In my experience, small doable changes, implemented gradually, bring the biggest results! This is key to not burn out and get discouraged. Today I want to share a few tips on making small changes in the kitchen to keep on track with healthy eating, which a lot of us made a goal this year. buy fruit that is in season– it almost always tastes better. For example, in winter this includes oranges, pineapple, pears, apples. 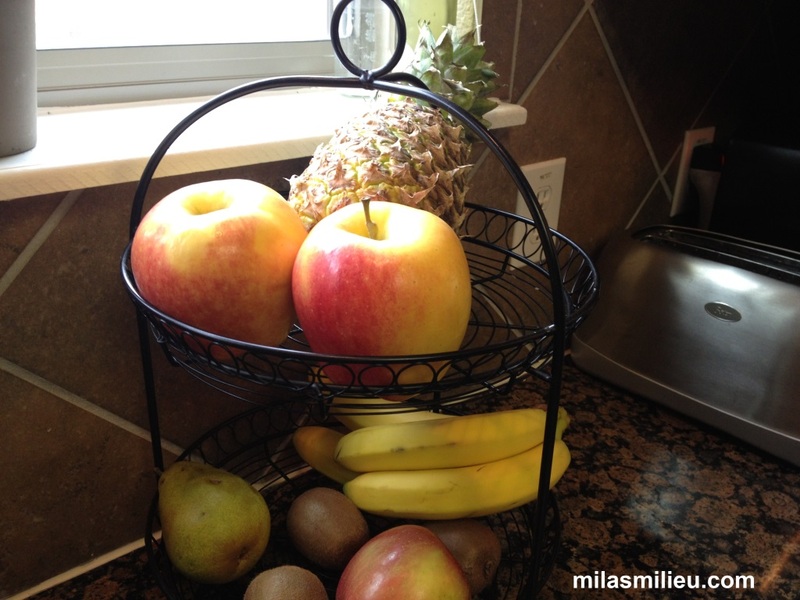 wash your fresh fruit as soon as you come home from the grocery store. It may sound like a chore– you want to just put everything away and be done. However, if you have your fruit washed and all ready to grab and eat, it will save you time and work later. I started doing this over a year ago, and noticed that our consumption of fresh fruit has definitely gone up. I do not pre-wash berries because they don’t last long if you wash them. 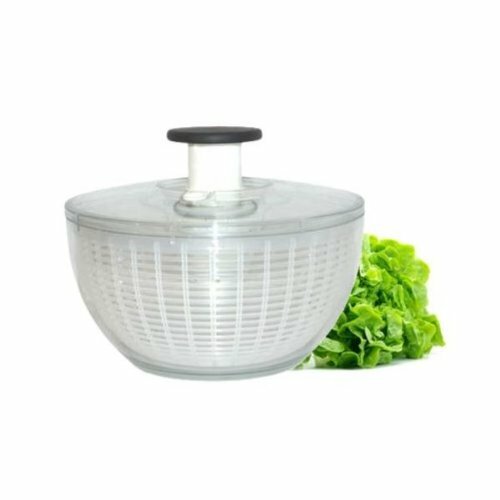 invest in a salad spinner, if you haven’t already. I have this one which I found at Goodwill and use it a lot. Now I can buy large bags of Romaine lettuce and wash and dry a head or two at a time. I keep chopped lettuce in a zip lock bag in the fridge– so easy to grab, add some veggies, and you got a salad. Chopped and bagged lettuce lasts up to 3 days in the refrigerator. here is another way to store your lettuce from Paula at “Salad in a jar” blog. 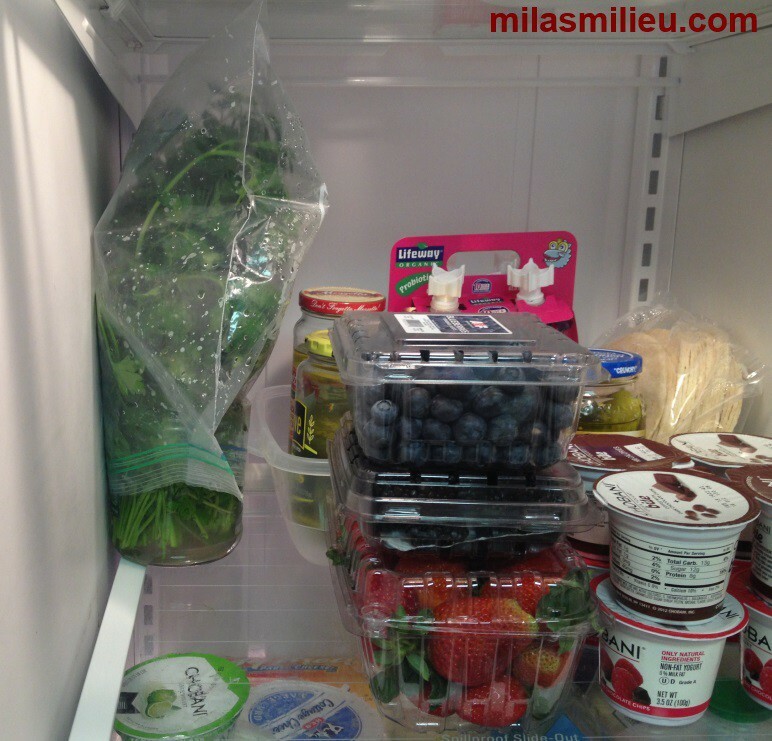 She has great tips on storing and eating salad. This is a great way to cut calories that come in salad dressing! I only need a tablespoon of olive oil to dress a large bowl of salad: the herbs bring in the flavor that you normally add via salad dressing. Whenever I serve this kind of salad to my guests they always ask what kind of dressing I use, and are surprised to hear that it is just a bit of olive oil. Tip: add the olive oil to the bowl before adding salad, then toss. This way oil is evenly distributed without drenching the salad. Flat leaf parsley, cilantro, green onions and dill are my herbs of choice: they keep well in the fridge and add a ton of flavor to salads. To store parsley and cilantro, I put them in an old pickles jar filled with water and put a plastic bag over them. I keep the jar in a back corner of the fridge out of the way. When I am making a salad, I tear off a handful of the herbs and return the rest to the fridge. Store dill wrapped in a damp paper towel inside a small zip-lock bag. It will need to be used up pretty fast, that’s why they usually sell it in small packages. It adds amazing fresh taste to salads. Store green onions the same way as dill. It keeps about 3 days. In the spirit of keeping it simple and easy, you can start with just one kind of herb and expand the variety as you get used to using them. Do you have any tips on making eating healthy easier? Please share.